The German, Swiss and Austrian Group of the Cities of London and Westminster Conservative Association connects people of German-speaking heritage and interest with like-minded Conservatives in London. We help to foster bilateral relationships between our German, Austrian and Swiss community and the Conservative Association in London. Our aim is to provide a platform for political and cultural exchange, networking and education. We work with a plethora of individuals, political organisations, academia and business associations in pursuit of this fundamental aim. We increase the awareness of the Conservative Party within the German speaking community in London and the UK. To ensure that the needs of Germans, Austrians and Swiss are represented in politics, we support the political engagement of our community. We campaign for Conservative candidates and raise money to help campaigning activities. 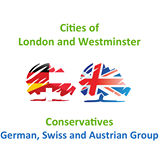 Members of the Cities of London & Westminster Conservatives - German, Swiss & Austrian Group automatically become members of the 'Cities of London & Westminster Conservatives Association" and are therefore welcome to all events and campaigning activities. To get in touch please contact the CLWCA office at 90 Ebury street on office@twocitiesconservatives.org.uk, or by calling 020 7730 8181.